Hex the Robot – Man of Steel? Have you ever talked with someone and just gotten a sense that they were a really good person? 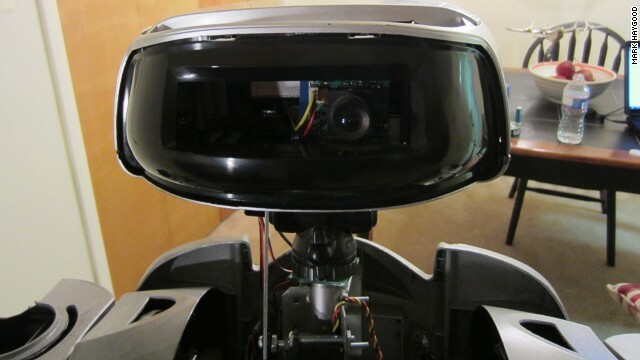 I felt that way after speaking with Mark Haygood about his full-scale humanoid robot, Hex. He has big plans to improve Hex and develop him into a kit that can be used by schools and youth programs to interest kids in technology. Mark poses with his creation, Hex the robot. Mark is a retired police officer from Baltimore. He still works for the city’s Criminal Investigative Division. Though he doesn’t patrol the streets anymore, he’s still concerned about the community. The crime rate in Baltimore is at unprecedented levels, and much of it is youth-related crime. “There is a sense of hopelessness,” says Mark. Back around 2009, Mark felt the need to “do something.” He decided to fall back on a lifelong interest of his, robotics. “Robots have been part of my life since I was eight or nine years old,” Mark tells me. His mom taught him to love reading, and he learned everything he could about robots. Mark built himself robot toys out of any junk he could get his hands on. He recalls how the encouragement he got from his mom helped him develop into the man he has become. Mark knows that a robot kit won’t fix the difficult situations many kids face growing up, but he hopes that it can inspire at least some of those kids to reach higher. Baltimore, and many other cities, could certainly use a man of steel to swoop in and save them. While Hex isn’t a caped super hero, he could offer some hope to kids that need it. “Once kids are involved in building something like this,” says Mark, “they’ll know there’s nothing they can’t do if they are really determined to do it.” That’s definitely a page from Mark’s own book. He never quits when he has set his sights on accomplishing something. Hex poses with some of Mark’s friends from the Baltimore City Police. Mark has been working with the Baltimore Hackerspace to build Hex. He’s also active with the Baltimore County Police Explorer Program, a non-profit organization that works with kids aged 14-20 to help them develop character and appreciate community. Through organizations like these as well as through local schools, Mark has been trying to introduce kids to robotics. He’s especially interested in reaching kids who might otherwise fall through the cracks. Although Mark has brought Hex to show kids at robotics clubs and conventions, it is more challenging to reach kids who don’t have a supportive parent or mentor and a safe place to learn and grow. If a kid is not on the path of learning, it can be very hard to reach them. Hex 1 was a solo project that took Mark a considerable amount of time and money to build. The next version will be better, more repeatable, and designed as a kit. Mark is building a team to help him make it happen. He has set up a Kickstarter page to help raise funds for the project. Dr. Paul Oh is a professor at Drexel University and director of the Drexel Autonomous Systems Lab (DASL). Dr. Oh has endorsed Mark’s Kickstarter and has offered to help Mark in any way he can. Mark intends to make the plans available to any school or group that can raise the funds for parts and then offer an online forum to assist in the build at no cost. He plans to develop Hex 2 as an open source project, allowing the schools, robotics clubs and anyone else who build one to contribute. Paul Laurence Dunbar High School in Baltimore has already expressed interest, and Mark is seeking other venues and a more national stage. So if you are looking for a way to do some good and spread robotic geekery to the next generation, please visit the Hex Humanoid Robotic Platform Kickstarter page and help out. I’m backing this project.